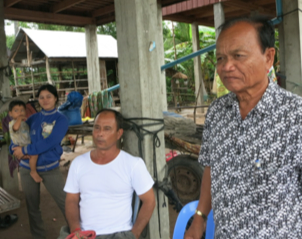 On September 17, 2014, we went to Prey Veng province to visit Theara, a former IBJ client recently released after being acquitted. Theara’s house is only 40 kilometers away from IBJ’s provincial Defender Resource Center, yet it took us nearly three hours to drive there considering the rain and mud. 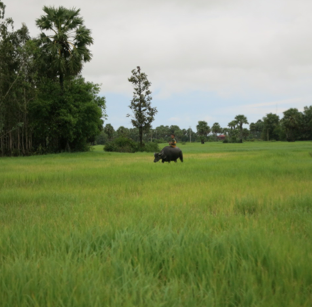 IBJ Lawyer Mr. Prak Phin and his assistant Mr. Leang Sina drove us through many green paddy fields until we finally arrived in the early afternoon where we met Theara with his family to tell us his story. Back on December 17, 2013, Theara and his wife suddenly woke up at 8: 30pm after hearing a gunshot. His mother in law, living in the house next door, wanted to see what was happening and Theara’s wife asked him to go with her mother. When they arrived at the neighbor’s house where the noise had come from, a lot of villagers were already there. A group of four men had apparently gone into the house with guns to rob the owners. They kicked the husband, bound his hands and threatened his wife, asking for her jewelry and cash. According to the victims, they stole a total of 12 million riels (about 3,000 US$) and an additional 1,545 US$. By the time the villagers and later the police officers arrived at the scene, the four men were already gone. Nevertheless, the victim’s wife said she recognized Theara as one of the men who had just robbed her. She said that she heard the perpetrators speaking in a particular dialect which was, according to her, only known by Theara in the village. With no further investigation, the police officers arrested Theara and took him to the police station for further interrogation. While in police custody, the officers told Theara to confess and demanded to know the names of the other perpetrators. When he denied being involved, they started to kick his left leg, which was already weak, again and again for several hours. No one informed him about his right to a lawyer and he had never heard of legal aid services. After two days in police custody, Theara was sent to Prey Veng prison where he endured an overcrowded cell and harsh conditions. This story shows once again how proper investigation techniques in Cambodia are less often used. Due to a lack of means and will, arresting someone and making him/her confess is still the more convenient and cheapest way of solving a crime for the police. After a few months in prison, a court clerk finally asked Theara if he had a lawyer. As he did not, the investigating judge appointed him IBJ Lawyer Mr. Prak Pin. The first time they met, Theara felt stressed, but was also relieved not to be alone anymore. 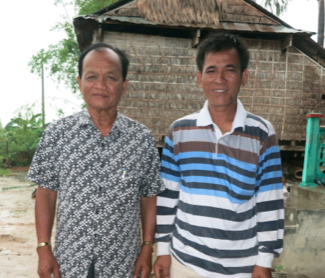 From the moment he met Prak Pin, he trusted him and knew he had a chance to get out of prison. On August 28, 2014, after more than 8 months of detention, the trial finally took place. Theara was accused of theft with violence, punishable by imprisonment from three to ten years according to article 357 of the Cambodian Criminal Code. 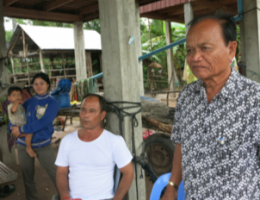 The IBJ defense lawyer brought exculpatory pieces of evidence before the court, including 8 eyewitnesses, one of which was the victim’s aunt, and 58 villagers’ testimonies (including the village and commune chiefs) attesting to Theara’s alibi and innocence. On September 3, 2014, the judge issued his verdict: Theara was acquitted. He was released five days later. He immediately went to take care of his mother in Battambang province (450 km from Prey Veng) who had fallen ill while he was in prison. Theara is now taking care of his mother and working to cure his left leg before returning back to work as a fruit picker in a few months. 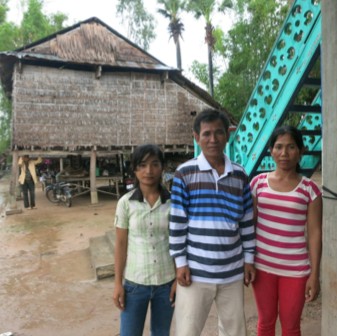 While Theara was detained, his 16 and 17 year old daughters had to work at a factory to support the rest of the family, including a three year old baby, while his wife was forced to take out a loan. Though he is now back in his village, he has yet to see the neighbors who accused him of theft and is afraid of meeting them again. “I have a family to feed and a loan to reimburse, so I need to work as soon as possible and avoid problems.” Unfortunately, this is also the reason why he will not be suing his neighbors for compensation or prosecute the police for ill-treatment.